Sedona art galleries for a long time have shown Heyoka Merrifield’s artwork. Even prior to his leaving art school, gallery and national art magazine patrons saw and appreciated his work. Nevertheless, when he contemplated a life in the dispirited contemporary art scene just before leaving school, he decided to become a farmer. Living “off the grid” on a remote Indian reservation, Heyoka continued to create art while making his ceremonial artifacts, enlivened by his own personal visions. During this formative time on the reservation, he began to connect with the archetypal symbols of his Native American ancestry, as well as those of other ancient cultures that had always inspired him. It was during the period he spent on the reservation that Heyoka developed the understanding that archetypal symbols actually represent the powers within all humans, not just “royalty” or the “ruling class.” For example, the King represents our primary purpose in life, the Queen represents the Earth Mother principle in all people, and the Eagle is our spirit essence. Instead of projecting these traits onto “royalty” or celebrities, Heyoka believes that all individuals need to take responsibility for our innate powers, bring them into balance, and manifest the gifts we may then give to the world. 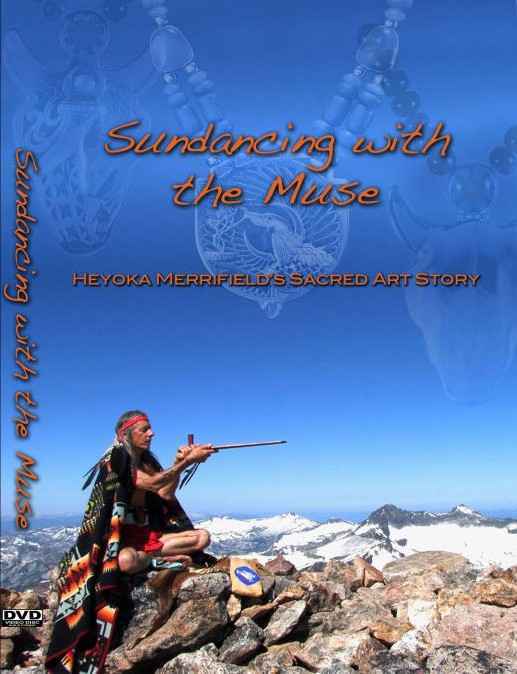 Heyoka recently created with Montana film maker Jason Gutzmer a new art piece embodied in the feature-length documentary film “Sundancing With The Muse.” The film demonstrates Heyoka at work making his sacred jewelry and sculptures. It also shows how his ceremonial life empowers his artwork and includes rare archival footage of the Montana Crow Indian Sundance. Heyoka has sun danced for over thirty years and, at 70, is the oldest active dancer in the ceremony. "Heyoka Merrifield is a medicine man, a priest, a guardian of doorways and a powerful conduit to the understanding of the complex intricacies between our world and the world of the spirits and ancestors. This position at the threshold between worlds underscores the exquisiteness of the art coming out of his hands. Every piece he makes is a ritual puzzle that encodes a healing message from the other world. We cannot afford to ignore his message." Malidoma Some, PhD: Of the Dagara tribe in West Africa, author of Ritual and also Of Water and the Spirit. “In his art, ceremonies, and stories, Heyoka is touching into the radiance of creation” Neale Donald Walsch. Author of the Conversations with God series.